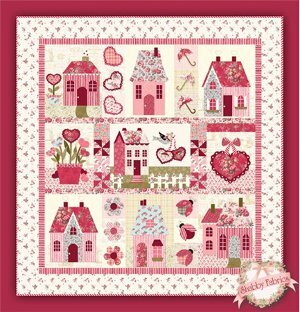 The Sweetheart Houses quilt pattern from Shabby Fabrics is the perfect throw or wall hanging for Valentine's Day and more. Make the adorable applique quilt to celebrate Cupid's big day, or use it all year round to decorate a room with feminine charm. This darling quilt pattern features nine blocks of variable size. Seven of the blocks show sweet houses in red, pink, and blue fabrics, each of which has a combination of window, door, and roof appliques that makes it completely one-of-a-kind. Picket fences, flower pots, and garden paths add special touches to a few of the house scenes. The other two applique blocks set off the center house block with an applique valentine and an applique flower pot full of heart-shaped flowers. Strips of miniature blocks separate the house blocks, interspersing the quilt with pinwheels, umbrellas, ladybugs, hearts, and flowers. The quilt is finished with a few strips of skinny sashing in red and pink fabrics and a wide floral border, making the final product 65" x 68". Although this beautiful quilt top may seem complicated to create, the Sweetheart Houses quilt pattern makes it easy to finish this project, even for a beginner. The pattern includes a detailed materials list with a full-color fabric selection guide to help you find the correct amounts, colors, and patterns of fabric. For quilters who are unfamiliar with applique quilts, the pattern includes a step-by-step spray starch applique tutorial with clear, instructive photos for each step in the applique process. This helpful section of the pattern is provided so that even novice quilters can enjoy the Sweetheart Houses pattern. The rest of the pattern is divided into separate blocks, so quilters can break up the quilt into more manageable projects. Each block pattern comes with full-size applique templates that can be used for any applique method. The block-by-block structure of this pattern fits tidily in a block of the month program, in which quilters receive the necessary fabric for each block on a monthly basis. Quilters can sign up for the 10-month program, which begins in July 2012, on the Shabby Fabrics website. What fabric line does this quilt feature? I would love to have the patterns for this quilt. Please send information as to where or how I can find it. I love this quilt!! Can I get the pattern still? If I read the site correctly it is $42.00 for the patterna and embellishments are available for additional fees. Is this pattern still available? Just the pattern, not the block of the month deal.